Using PowerPoint effectively when you next have to give a presentation doesn’t have to be a chore. Your decision to use PowerPoint is fine. Because it’s a useful tool for the job. But like all good office tools there are some simple guidelines for using PowerPoint effectively. So, here are five simple PowerPoint presentation tips to help you get the most from your next PowerPoint presentation. Content. Ensure that your PowerPoint content is relevant for your audience. You can check its relevancy with audience research or insights into the industry or market which your audience represents. Rehearse. You must be familiar with your PowerPoint material, its context and timing. Once you are familiar with your PowerPoint slides you will appear more natural. So, aim to rehearse your presentation as much as possible. Just remember to build a structure to your presentation. Adrian Jones did just that with his Legoland Florida presentation. Also, do make sure that you know the facts and figures that you quote. Eye contact. Eye contact is so important when you present. But PowerPoint tempts you into reading your notes or thinking that an audience is interested in reading a bullet list. They are not. They want to listen to you, the presenter. Look at your audience. Whatever happens, don’t be tempted to read from the presentation slide screen. Because, not only do you turn your back on your audience but you also appear less knowledgeable. Take some questions. A well-built PowerPoint slide deck should allow you to hold a slot for questions before you reach your conclusion. So, use a blank slide while you hold your question and answer session. You can also refer to supplementary slides if you feel they add something to an answer. 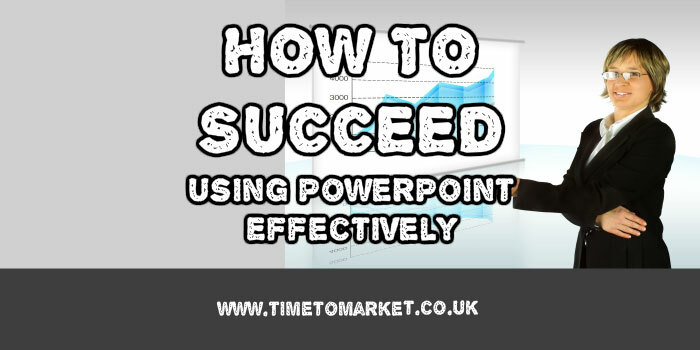 Five key pointers helping you to succeed using PowerPoint. Rehearse and practise before your presentation. Make sure that you have good eye contact with your audience. Look at your audience and not at your slides. Be prepared to take questions as it shows good engagement. You can always aim to improve your PowerPoint and other presentation skills with a PresentPerfectTM training course. And, of course, you can always ask us to train you, or your team at your office. So, please don’t hesitate to get in touch when you need further assistance. You can always call or email: training@timetomarket.co.uk.